Yesterday's blog/rant (and a conversation this morning) have led to this being a thing. Why, yes, I have been working out. Thank you for noticing. I'm really more of a ranter than a punisher. Mind you, I think it's a good look for me. Let's see what's happening on the Radio Nova prize winner's guitar. 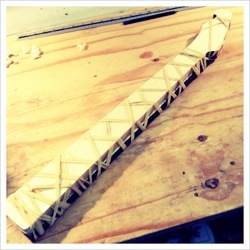 Last time around, we saw the neck completed—it was cut, shaped, carved, fretted and so on. That and the body were sanded. A lot. Finish-prep really builds those arm muscles. There are a number of sanding stages, each with a slightly finer grit and each involving a lot of inspection for little imperfections in the wood that will translate into bigger imperfections in the finish. Finally, though, it's ready for some finish. Finishing schedules vary depending on what you're working on, what you're using, what effect you're trying to achieve, and exactly seventy-three other factors. Well, more or less. What I'm getting at, though, is that there isn't a definitive way of going about 'finishing a guitar'. With that in mind, let's take a look at how this Bassmaster has been finished. As the body is a nice piece of ash, I've decided to accentuate the grain a little. Some creative grain-filling will do the job. Grain-filling, by the way, is necessary on certain woods in order to achieve a smooth, flat finish. Many woods (ash, for instance) are considered 'open pore' woods. This means that the grain pattern tends to have a lot of tiny holes or pores. If these aren't filled, the finish applied will simply sink into the pores and won't allow that perfect gloss that many like to see on their guitar. The grain doesn't have to be filled and leaving it unfilled is perfectly acceptable if that's the effect you're going for. Here, it's not. I (usually—see above about schedules) shoot a sealer coat onto the wood before filling the grain as that tends to make it a little easier to manage filling. After grain-filling, I carefully remove the excess filler and let it dry. Then I seal that in too. That's the stage you see in the first image above. Now to take some of that pale look off the wood and warm things up a little. A coat of amber-tinted lacquer will take care of that quite nicely. As this instrument will be a 'black-burst', I've hit the edges first with some black pigmented lacquer. I get these coloured first, before moving on to the top and back and the actual burst. Incidentally, the reason you're seeing the back of the guitar in all of these shots is that I'm spraying this in the old Fender style. On the front of the guitar are three nails that support it—raised—above a turntable. When spraying, I do the front first and then flip it to do the back. It's at this point I can more easily take a photo. Now the money-shot. The burst has been applied to the body. For any readers who don't know what the hell I'm talking about with all this 'burst' talk, it's a method of applying finish with a gradual fade from one colour to another. Burst is short for 'sunburst' a term coined (I think) early in the last century. There are many kinds of sunburst finish and different manufacturers have different styles and methods but the most common are one and two graduating colours from a lighter centre (which, make what are called two or three-colour bursts). In this case, we have a two-colour burst: Light amber at the centre graduating to black. 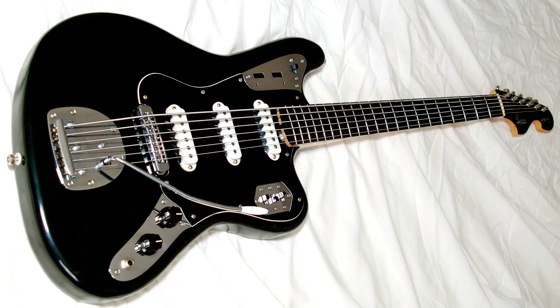 A black-burst. We'd better not finish up without a word about the neck. This neck has a dark, ebony fretboard. Couple that with this headstock and we've got a nice, Spinal Tap, none-more-black thing going on. 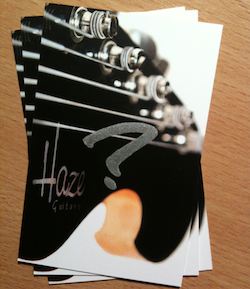 A silver Haze logo and a Bassmaster 6 logo applied and we're good to coat over with clear lacquer. And that's where we're up to. This was all completed a while ago and is sitting, waiting for the lacquer to properly cure. At that point, I can wet-sand back the finish on neck and body before buffing the hell out out it to get things nicely glossy. In the meantime, there are a few smaller jobs like cutting the pickguard (a custom shape so no easy route of buying something off-the-peg). What should be the final update in this series soon. Stay tuned. Time for an update on the Nova Bassmaster. I say 'time' but what I actually mean is 'incredibly overdue'. Sorry about that but, when things get busy, sometimes blog posts and updates fall behind. Rest assured though, that progress on the Bassmaster has been… well… progressing. The image on the left shows the body with the additional control cavities cut. Also new since the last update is the neck pocket. In common with the Haze Blue Collar, this instrument also has the neck pocket cut at a slight angle (about 2°). It's not strictly necessary on this bass but doing so allows me to get a little more break angle from the strings over the bridge. This improves the tone and sustain and helps keep everything in place down there. Most of the work since last time, however, has gone into the neck. 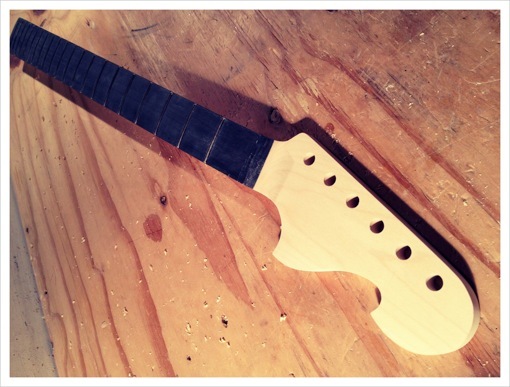 The first image above is mainly just the outline where the neck will be cut from this maple blank. You've probably spotted two channels already cut. These are actually going to hold carbon-fibre rods that will help to stiffen the neck and prevent the tension of those six, chunky strings from bowing it too much. The rods are epoxied in place and, as they're carbon-fibre, they don't add any weight to the neck. There will be an adjustable truss-rod too, of course but I thought you might find this interesting. The image on the right shows the fingerboard being glued to a neck. Yep, those are rubber bands. Actually those are two very, very long rubber bands and they are great for jobs like this. They provide a firm, even pressure that's perfect here. Seriously. On the left is what we end up with. A flat hunk of maple in a vague neck shape and a flat lump of ebony stuck on top. Incidentally, I've already slotted the fingerboard as it's easier to do that before it's glued in place. What we need to do is to start shaping things. The overhang of the ebony fingerboard is removed. Then the recessed headstock face is cut. The fingerboard is radiused and I wonder—as I always do at this point—why on earth I would bother to work with a wood as bloody hard as ebony. The reason, of course, is that it's a beautiful looking and sounding wood but, damn, it's hard work. Fretting time. On the left, you'll see some of the tools I'll use. When I started doing this racket, I hammered all my frets in (old skool). I began to press frets in more and more (mainly as good tools became available to me). Oddly, in the last while, I've been making the move back to hammering more often. Whatever way they go in though, I almost always now use glue too. Glue-in fretting has become pretty popular with repair-guys and smaller builders over the last ten or fifteen years. For good reason, I think. It's not always merited on repair work but I tend to glue frets on most of my own builds. It slows the job a little but I think it's worth it. There are a number of different methods of glue-in fret jobs for a number of different jobs and builders' preferences. That's possibly a topic for another day though. Speedy catch-up: Frets glued and clamped until dry. The fret-ends on the edges are brought flush with the sides of the fingerboard so a player won't have to rush to the Lacerated Hand Ward of the nearest hospital while the ends on top of the fingerboard are bevelled at an angle to feel more comfortable. Then, the curve at the back of the neck is roughed in before being more carefully carved. After that, a lot of sanding and it's ready for finishing. And that's where it is right now. More soon. So, if you've been following along (of course you have), you'll know that the winner of Radio Nova's Rocktober Win-A-Haze-Custom-Guitar competition is keen to get hold of a Bassmaster—the six-string, short-scale bass. Groovy, indeed. So, I figure we're overdue a bit of an update on the progress of this build as it makes the transition from hunk of wood, to a fantastic, rocktastic, basstastic, instrument. 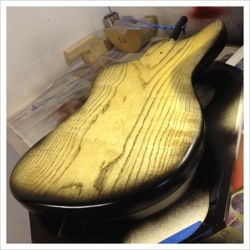 As this bass is going to be finished in a snazzy, 'black-burst', I've selected a nice, one-piece ash body. 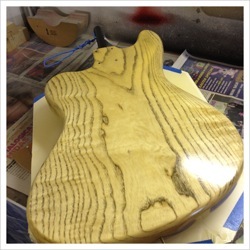 That grain will peek through the finish and look very tasty indeed. So let's get it moving. The first image above shows the rough-cut body. I marked the shape on the ash blank using the well-worn template you can just see behind (making templates is pretty dull but it's time well spent) and band-sawed close to the outline. This leaves me with a vaguely guitar-shaped bit of timber with reasonably rough edges. Those rough edges are soon taken care of with a router, however. Then the control and tremolo tailpiece cavity are routed (the image on the left). It's starting to look a bit more like a guitar, isn't it? To my mind, though, it's the rounding over of those sharp corners that really starts to make this look like an actual guitar. I always feel this step (photo on right) is when the wood stops being a bit of a tree and starts being a guitar or bass. There's still some routing to be done on this. The neck pocket, obviously and the cavity for the rhythm circuit. More on these soon but, for now, I think we'll do some work on the neck.